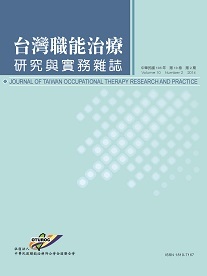 Objective: The aim of this study was to determine the attitudes of occupational therapy practitioners towards evidence-based occupational therapy (EBOT) and identify the barriers to implementation of evidence-based practice in Taiwan. Methods: A total of 148 delegates of the 3rd Occupational Therapists' Union of Taiwan (45.4% response rate) completed a questionnaire. The demographic data were analyzed using descriptive statistics. We identified 12 barriers to EBOT and proposed five approaches to improving the situations. Results: Overall, the majority of the respondents welcomed EBOT in the moderate level and agreed that its practice improves patient care. They had a moderate level of awareness of electronic databases of evidence-based literature (57.6% knew of the Cochrane Database of Systematic Reviews). As high as 85.1% and 95.0% had access to databases of EBOT and the world wide web, respectively. The major perceived barrier to practicing EBOT was lack of personal time. The respondents felt the most appropriate way to moving towards EBOT was using evidence-based guidelines or proposals developed by colleagues. Conclusion: In order to implement EBOT in Taiwan and overcome the barriers, actions should be taken to facilitate effective and efficient use of electronic databases and develop guidelines of evidence-based practice.